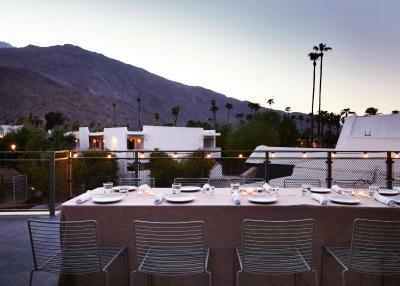 Lock in a great price for Ace Hotel and Swim Club Palm Springs – rated 8.5 by recent guests! My room was dirty. I found a bunch of hair at the shower. Location and overall atmosphere was excellent! 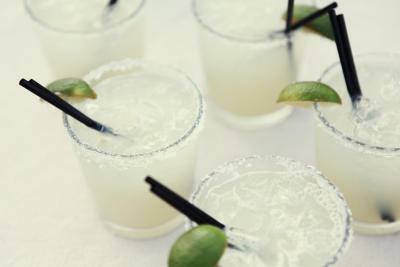 The pool was great, the restaurant on property was great and the bar on the property was a nightly source of fun! On the whole we enjoyed ourselves - the atmosphere around the pool on a weekend is nice! We love the Ace and Booking.com is always reliable and easy to use! Jp, at the front desk, set the tone for our stay. He was fantastic and so was his manager!👍👍 Hands down, the best check in experience I have had in my life. 🏅🏅🏅 I will be back. Thanks to all the staff for a wonderful weekend!! Great bed, pretty pool, great location, loved the bikes. Great food available. Heated pool was wonderful, especially since it happened to be kind of cool outside during our time there. 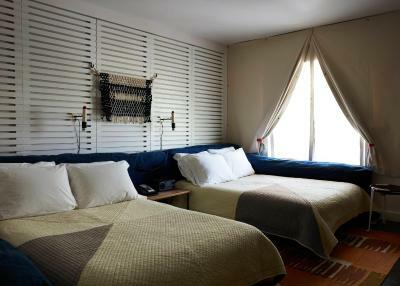 The property is very cool with good ambience and super clean. 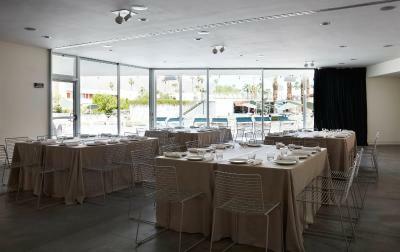 Most all of the service was great except for the poolside service which was friendly but SO SLOW and sometimes non-existent. You need at least one more server out there. The food and drinks were exceptional. The staff at the Ace were wonderful. Amazing massage at the spa. Great location. Ace Hotel and Swim Club Palm Springs This rating is a reflection of how the property compares to the industry standard when it comes to price, facilities and services available. It's based on a self-evaluation by the property. Use this rating to help choose your stay! 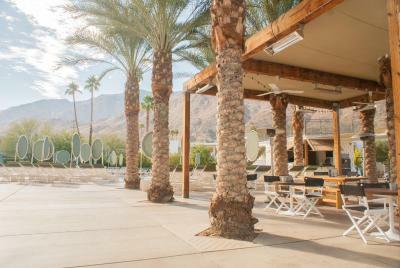 One of our top picks in Palm Springs.Set in Palm Springs, California, near activities such as shopping and golfing, this unique hotel offers contemporary guestrooms with free wireless internet access, a spa and an on-site restaurant. Guests can relax at the 2 outdoor pools as well. 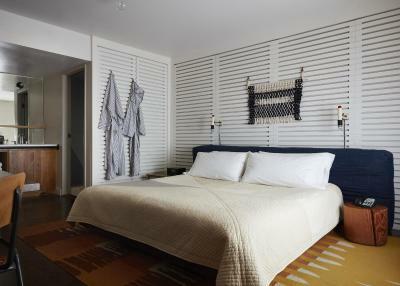 All guestrooms at the Ace Hotel offer a flat-screen TV and an MP3 docking station. 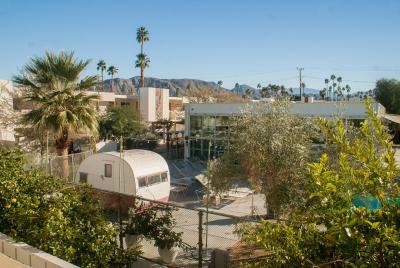 Guests will also appreciate bath products from Rudy's Barbershop and views of the city, pool or mountains. 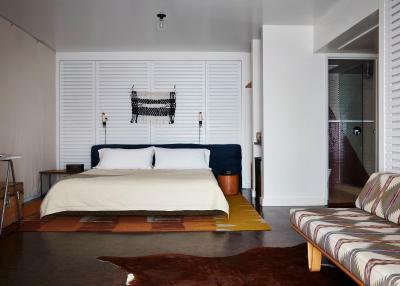 Ace Hotel and Swim Club features 2 outdoor pools and an outdoor fireplace. 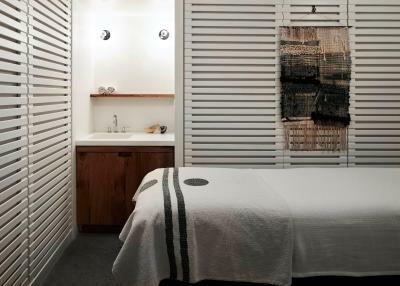 After a work out in the fitness center, guests can relax with a massage in the hotel's full-service spa. 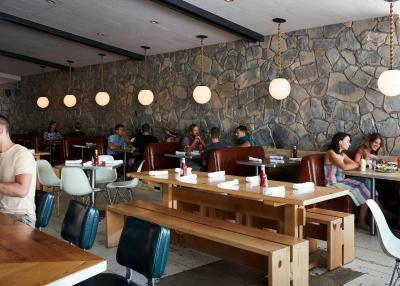 King's Highway restaurant at the Ace Hotel and Swim Club serves American cuisine made with seasonal, organic ingredients whenever possible. 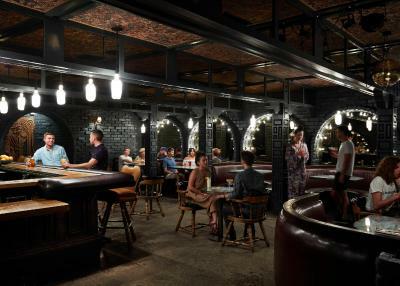 In the afternoon, guests can enjoy a creative cocktail in The Amigo Room bar. 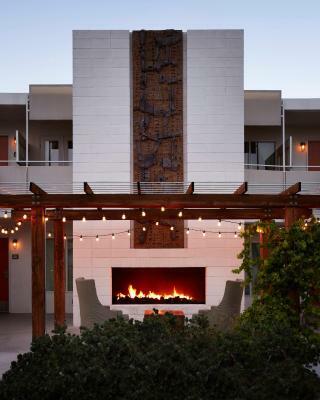 Indian Canyons Golf Resort is 1.3 mi from the property, while Saks Fifth Avenue is 1.7 mi away. 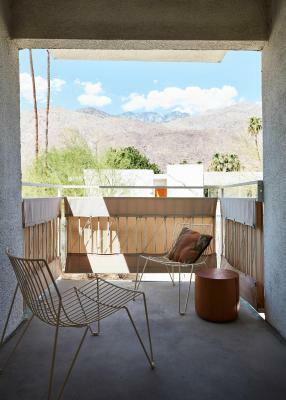 The nearest airport, Palm Springs International Airport, is 10 minutes' drive from the hotel. 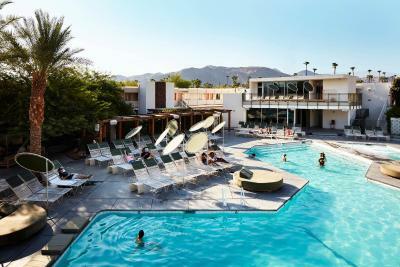 When would you like to stay at Ace Hotel and Swim Club Palm Springs? 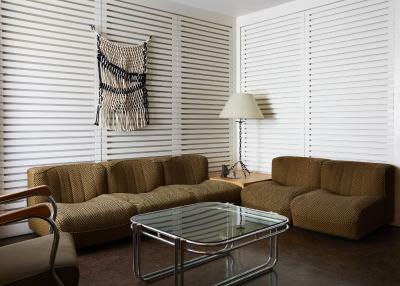 This air-conditioned room has views of the mountains or pool, a private bathroom, flat-screen TV and an MP3 docking station. 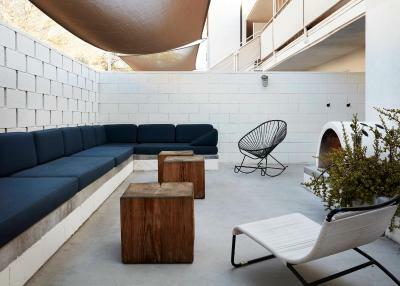 This air-conditioned room includes an adjacent private patio with a lounge area, a record player and unique vintage furniture. 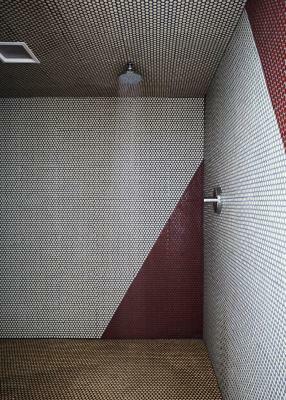 The private bathroom provides bath amenities by Rudy’s Barbershop. 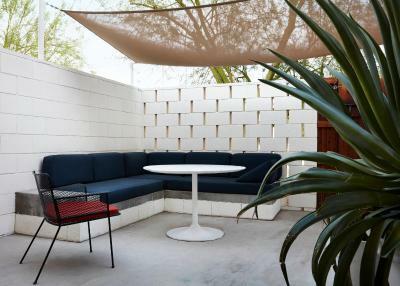 This air-conditioned room features a large adjacent private patio with a lounge area and a fire pit. It includes a record player and unique vintage furniture. Room features pool views. 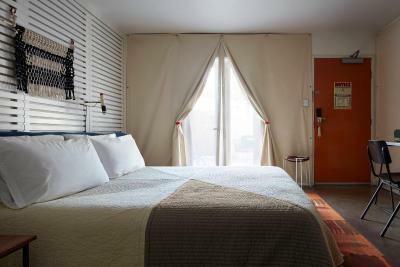 This air-conditioned room features city or mountain views, an private bathroom and a flat-screen TV. 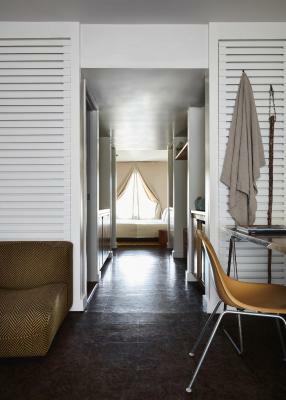 This suite includes a living room area with vintage furniture and a bathroom with shower, tub and bath amenities by Rudy’s Barbershop. 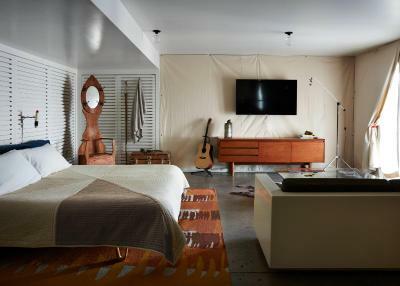 It includes a 55-inch flat-screen TV, a record player and a private patio with a fireplace and a lounge area. 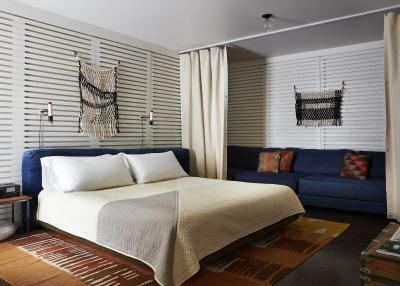 This air-conditioned suite features an upscale living room area with vintage furniture and a private bathroom with bath amenities by Rudy’s Barbershop. It includes a 55-inch flat-screen TV and a record player. 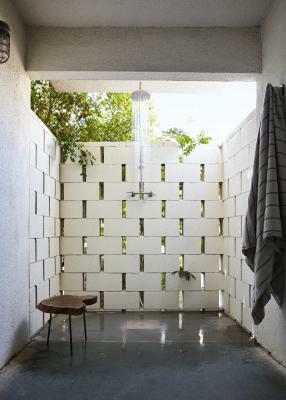 The design is organic and bohemian. 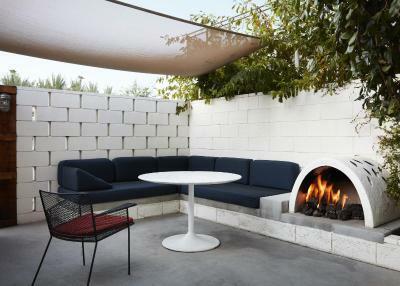 Some rooms have a garden patio and some have a fireplace. 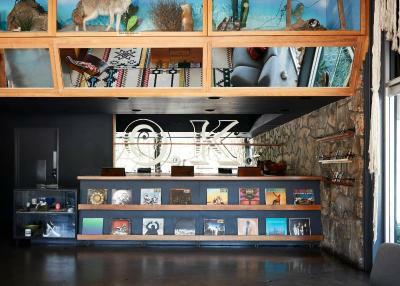 Some have record players and old vinyl you can play in your room and take home with you for a few bones. There are also communal fireplaces throughout. 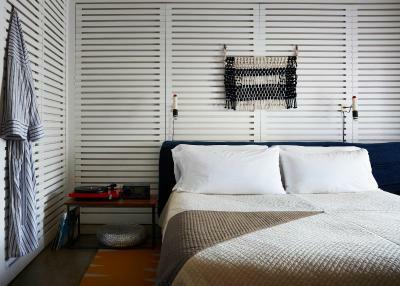 House Rules Ace Hotel and Swim Club Palm Springs takes special requests – add in the next step! 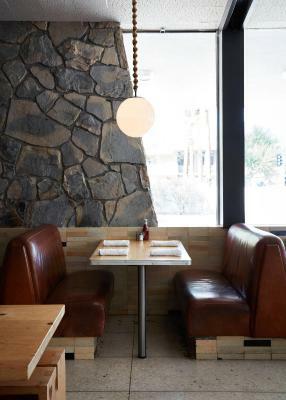 Ace Hotel and Swim Club Palm Springs accepts these cards and reserves the right to temporarily hold an amount prior to arrival. 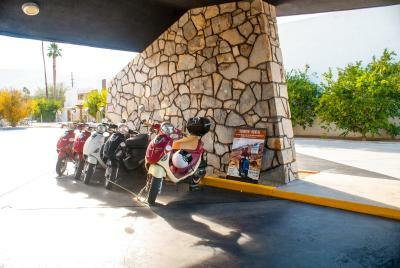 The resort fee is applicable per room per night and includes parking, wireless internet access, bicycle rentals and access to the swim club and the gym. All is amazing except from the doors to the rooms that slam so hard it wakes up the entire place. We, and our 8 month baby girl woke up every single time a person entered a room close by when closing their door. Location, pool, staff, everything is on top. Way overpriced! The bathrooms in the lobby were FILTHY with piles of paper towels on the floor. Towels and drinks around the fire pits were left for hours and not picked up. Fish tacos were AMAZING! 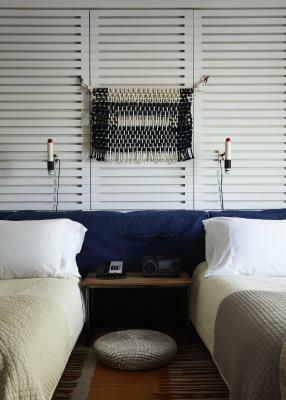 Cool vibes and décor. The pool area doesn’t get cleaned enough. There is a lot of dirty dishes, trash and used towels around. The staff seemed overwhelmed at times. People could also clean up after themselves I guess but that doesn’t seem to be the clientele’s preference. The staff were very helpful, they recommended an excellent bike ride in the neighbourhood to see some brilliant modernist architecture. They also changed a light bulb for us really quickly. 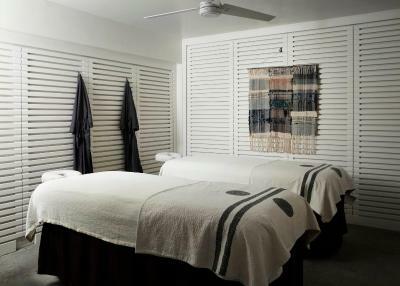 The staff is so friendly, the property super stylish plus I’ve had the best massage of my life at their FeelGood Spa. Definitely coming back! The service is BAD. Front desk were very helpful and polite, but the staff at the restaurant, cafe and all servers had a real hostile attitude. 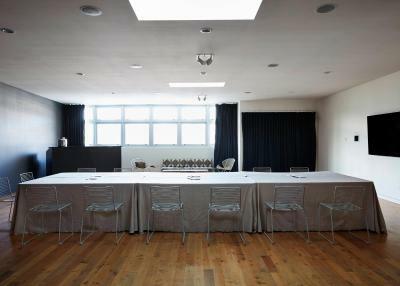 The rooms are extremely noisy. Music plays in communal areas until late. Some of the rooms also smell pretty bad (my friends switched rooms twice because of this) and all the rooms are very dark. There are no full length mirrors, and all appliances (iron, ironing board, hairdryer) are old and real bad quality - not what you expect for the price you pay. The pool is v small, and it felt odd to be at a day party with booze and DJ and loads of kids - maybe they need to think about scheduling? Honestly the only thing that’s really stand-out is the location. Bed was uncomfortable, air filters looked like they had never been cleaned and were so disgusting. The smaller, quieter pool is often rented out to private parties so you won’t always have access to it! Food was fairly disappointing and overpriced. Location is great and views of mountains are incredible! Pillows are perfect and I loved that there were lots of other families. Front desk staff was friendly and helpful. Our room was quiet. Mixed drinks were delicious. Past it decor. Forced Shoreditch hipster vibe. The mountains were very beautiful.